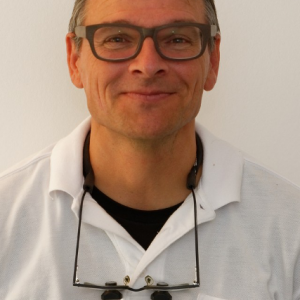 Dr. Friedli, born in 1966 in Lucerne, Switzerland, is an FMH certified dermatologist. He studied medicine at Bern’s University. He then worked as an intern in plastic surgery under Dr Walter Küenzi (famous in German-speaking Switzerland). André Friedli then moved to Geneva to study dermatology with the Professor J-H Saurat. Before settling in the beautiful region of Geneva, he completed his training in cosmetic medicine as a fellow under a leading authority in the field of lasers and cosmetics in the US, Dr. Richard Fitzpatrick. At the time, Dermatology Associates was the largest cosmetic surgery centre in the United States with one hundred employees. Dr. Friedli published many papers before settling at the Clinique des Grangettes.